“IN war, not everyone is a soldier,” cautions the trailer for this stark, thought-provoking experience. Game worlds brim with powerful heroes at war, one-man armies capable of subduing thousands of opponents. 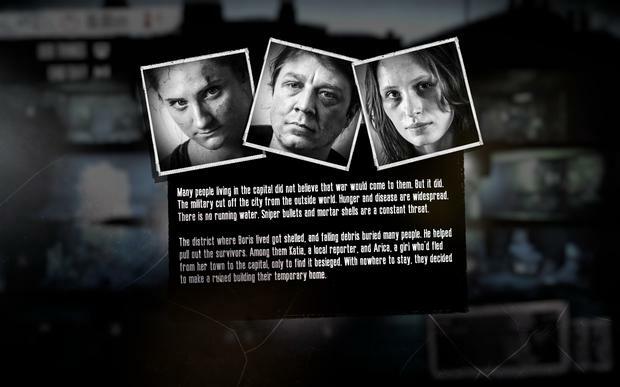 None of them recreates the grim reality of armed conflict the way This War of Mine does. Fun or entertainment isn’t the goal, even though the gameplay echoes the relentless resource-management of The Sims. TWoM focuses on three civilians barely surviving in a city reminiscent of a ruined Sarajevo. There are no heroes here, just ordinary people eking an existence. You can’t win or escape – merely put off the inevitable downward spiral. Yet such a dismal scenario proves enthralling, sustained by a series of heart-wrenching vignettes and a compelling game-y need to collect resources. By night, one of your three survivors scavenges buildings in the city for food, wood, medicines, anything. You may encounter, for instance, armed, desperate raiders or an elderly couple who beg you not to rob their stuff. Back at your “base”, your crew spends the day cooking, crafting better stuff – or arguing about the morality of stealing to survive. It begins simply enough, your trio in good health and spirits. Each night is an adventure, exploring the monochromatic world for supplies and revelling in your discoveries. Soon, the easy pickings dry up and you gamble your safety with a sortie into guarded homes, risking explosions of violence or just the guilt of filching others’ valuables. Your own base is vulnerable to raids and often your return after a night’s successful scavenging is ruined by the news that you’ve been burgled. But there can be moments of great compassion too, such as helping strangers who come to your door, or rescuing a woman from a thuggish soldier – at a risk to your own life. At times, you will find This War of Mine frustrating, unfair and gruelling. The busywork of maintaining the health, nutrition and mental welfare of your crew becomes a chore as you seek to build a safer, more comfortable home. But in keeping those three people alive, you’ll also find a well of humanity deeper than that of all the Call of Duty series put together. The tablet version lacks some of the features of the PC original, which was recently updated to add a scenario editor and character creator. But the developers promise to add those in due course. 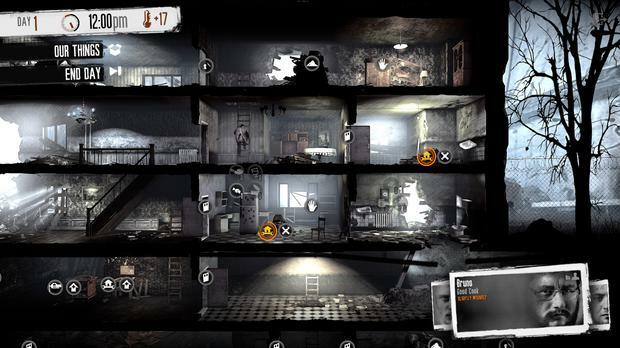 At €15, This War of Mine represents a considerable investment compared to most mobile games. But it’s a “gaming” experience not easily forgotten amid an app store catalogue of knock-offs, time-wasters and one-minute wonders.